Microsoft’s Lumia 640 and Lumia 640XL, announced on Monday at Mobile World Congress in Barcelona, add two new midrange phones to the Windows market. By name alone, the two should be nearly identical. 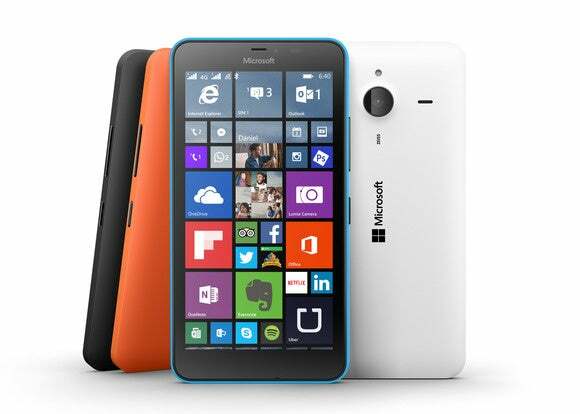 But they’re not, with the larger Lumia 640XL boasting a slightly more sophisticated set of features. And as you might guess from its name, the Lumia 640XL is large—though Microsoft slimmed down the concept a bit compared to the gigantic Lumia 1520 phablet (which is arguably too big). Update 2: Both phones, as it turns out, also include a year's subscription to Office 365 as well, a $70 value that make the phones even more valuable, and "lowers" their effective price without really subtracting any revenue. Why this matters: So far, Microsoft’s been happy to let its Windows Phone OS ride as a distinguishing factor, while steadily beefing up its phones’ basic capabilities with upgrades like Lumia Denim (which both of these phones will include), as well as apps like Lumia Camera. But it’s not a successful strategy—both iOS and Android are pulling away from Windows Phone, whose market share slipped from 3.3 percent in 2013, to 2.7 percent in 2014, IDC said. Microsoft helped set the trend toward larger phablets, and the 640XL doesn’t disappoint in that regard. But it’s no Lumia 1520, either. While the Lumia 1520’s 6-inch, 1920x1080 display wowed the eye, the Lumia 640XL takes it down a notch. The Lumia 640XL’s screen measures a comfortable 5.7 inches on the diagonal—the same size as the Samsung Galaxy Note 4—but with only a 1280x720 display. Physically, the Lumia 640XL measures 6.2x3.2x0.36 inches (157.9 x 81.5 x 9.0 mm) and weighs a little over 6 ounces (171 grams)—smaller, lighter, and slightly thicker than the Lumia 1520. The Microsoft Lumia 640XL is a 6-inch phablet for the masses, with dialed-back specs compared to the flagship Lumia 1520. The camera, always a selling point, has also been dialed back. The Lumia 1520 included a 20-megapixel camera with optical image stabilization, but the Lumia 640XL includes a 13-megapixel rear camera with no AIS. The Lumia 640XL’s selling points are the inclusion of Lumia Camera, as its continuous autofocus makes snappy shots a snap, and a 5-megapixel front-facing camera that goes far beyond the original 1520. Inside, the Lumia 640XL is no slouch. Microsoft’s Windows Phone OS and apps don’t demand high-end Qualcomm Snapdragon chips, so there’s only a Snapdragon 400 (MSM8226) inside, along with 1GB of RAM, and 8GB of flash storage (with a microSD slot supporting up to 128GB cards). The 3,000 mAh battery is good for 37 days of standby time and 24 hours of 3G talk time, the only battery metrics Microsoft supplied. The phone also includes Bluetooth 4.0, GPS, NFC, Miracast, 802.11b/g/n, as well as the SensorCore technology that allows the phone to act as a pedometer. The phone measures 5.56x2.84x0.34 inches (141.3 x 72.2 x 8.85 mm), and weighs 5.1 ounces (145 grams). Microsoft’s tag line for the phone is “prepared for anything”. A better line might be “prepared for anywhere.” Like the 640XL, the 640 comes in either single (U.S.) or dual-SIM configurations for the rest of the world. The Lumia 640 supports an even greater range of frequency bands than the 640XL, however, indicative that Microsoft’s really going to push this phone worldwide. Update: It costs 139 euros ($155) for a 3G model, while the LTE variant costs 159 euros ($178). Rumor has it that Microsoft plans to pop the champagne for Windows 10 with new flagship phones—which Microsoft confirmed, in part, in January. But both the Lumia 640 and Lumia 640XL will almost certainly be upgradeable to Windows 10 as well.